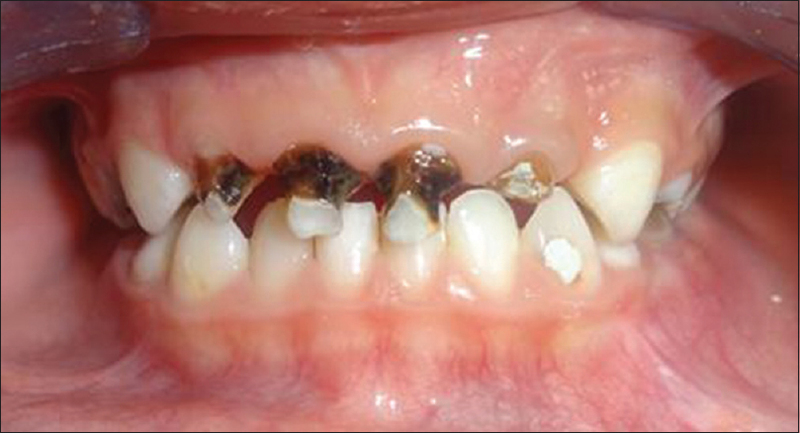 Early childhood caries (ECC) is a major health concern that affects the oral health of infants and children negatively. Early loss of primary anterior teeth due to trauma or caries can cause loss of masticatory efficiency, compromised esthetics, mispronunciation of labiodentals sounds, and development of abnormal oral habits. 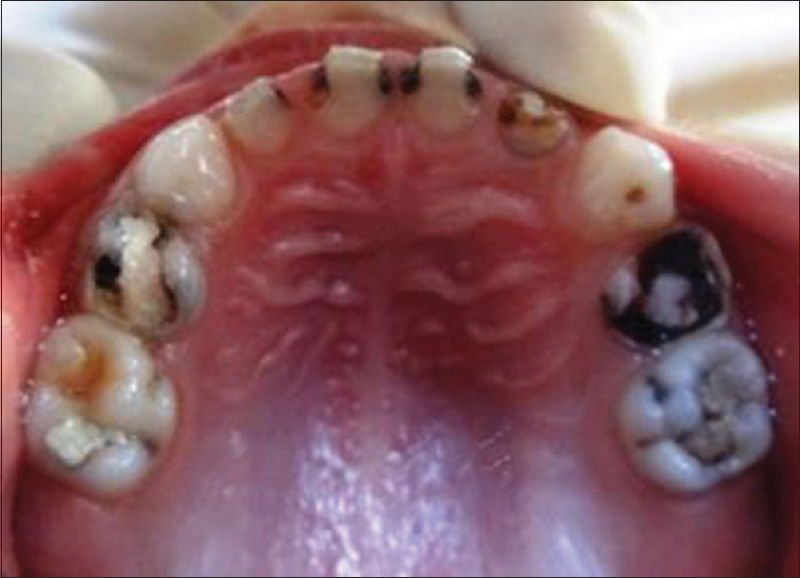 The restoration of grossly decayed deciduous teeth especially anterior ones presents a major challenge to dentists, particularly in uncooperative children. 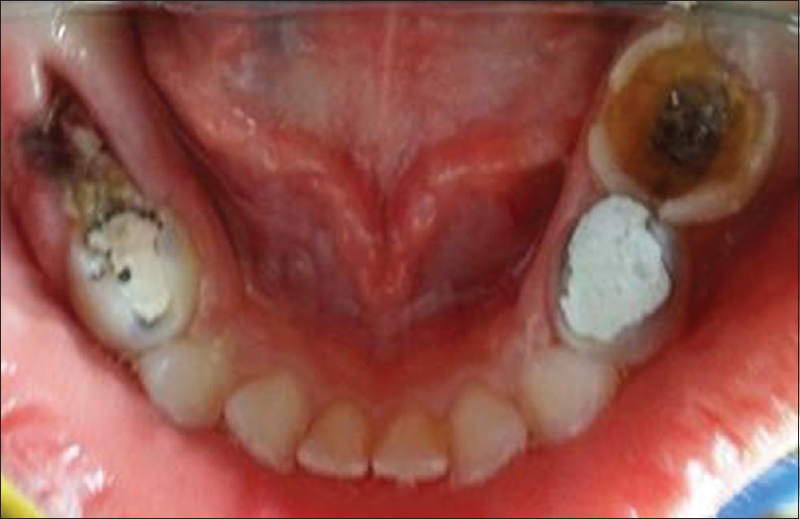 The following case report of cases of early childhood caries documents the restoration of severely decayed deciduous teeth to improve their oral and general health and help them to gain more self-confidence. Early childhood caries (ECC) is the presence of one or more decayed, missing or filled tooth (DMFS) surfaces in any primary tooth in a child 71 months of age or younger. 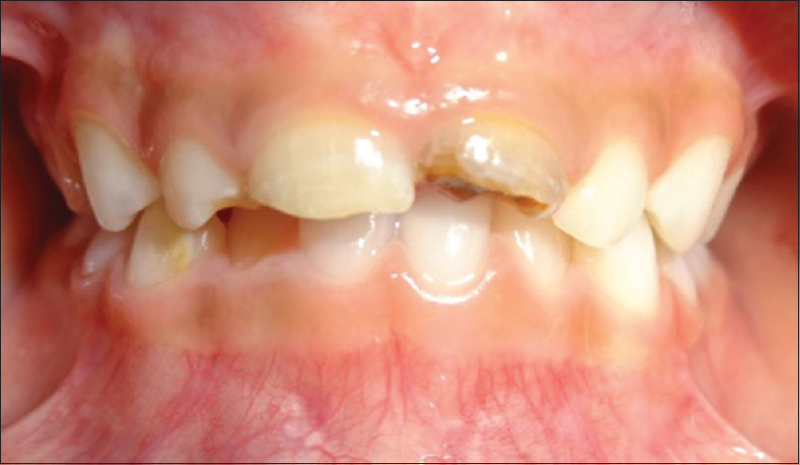 In children aged 3–5 years, severe ECC (S-ECC) is defined as: one or more cavitated, missing (due to caries) or smooth filled surfaces in primary maxillary anterior teeth, or DMFS scores of ≥4 (age 3), ≥5 (age 4), or ≥6 (age 5). It follows a characteristic pattern of development: maxillary incisors are affected first followed by maxillary then mandibular molars, and due to the protective nature of the tongue, the mandibular incisors are often spared. ECC has multifactorial etiology. One of the reasons is improper feeding practices adopted and adoption of more cariogenic food with the weaning of milk during this age. The loss of anterior teeth in children can lead to reduced vertical dimension and unesthetic smile which effect the child psychologically. Thus, it can interfere with the personality and behavioral development of the child. When these teeth are lost, replacement, and prosthetic management is very important to restore all functions including esthetics of the child. Treatment of S-ECC is complex and expensive, often requiring extensive restorative treatment and extraction of teeth at an early age. The most challenging in treatment of ECC is that children with age group 2–5 years are least manageable group of patients. 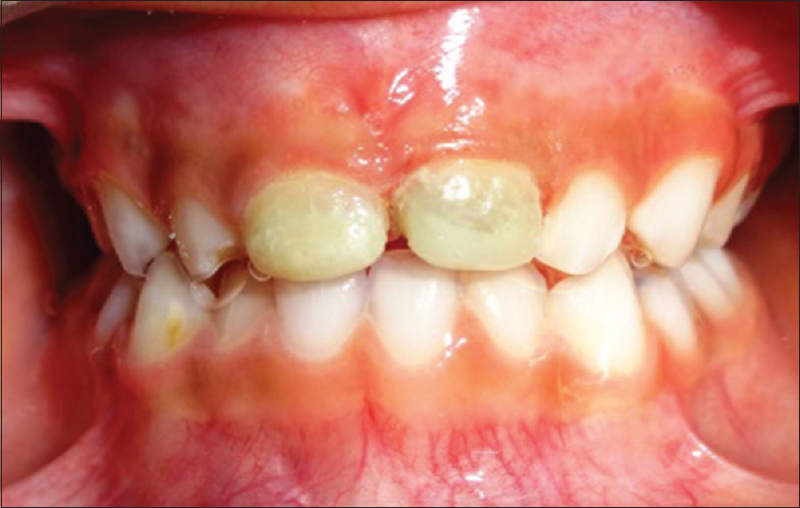 The present case report describes the task of treating three patients reported to the Department of Paedodontics and Preventive dentistry, H. P. Governmental Dental College and Hospital, Shimla suffering from ECC presenting with multiple decayed teeth. 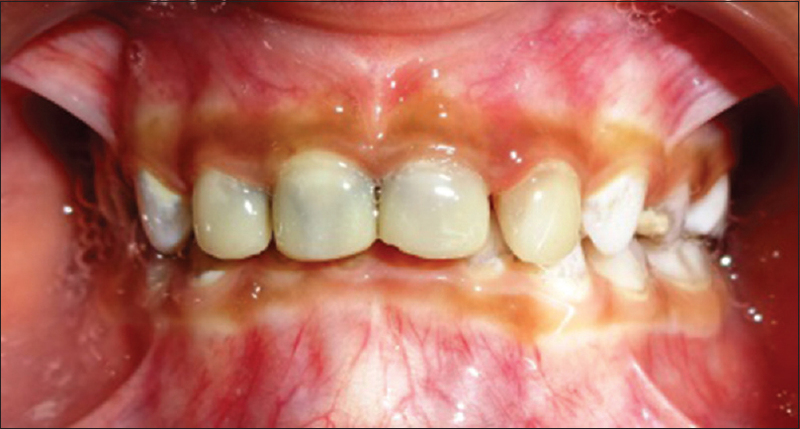 A 4-year-old girl with the chief complaint of decayed anterior teeth and pus in front teeth region. It was first dental visit of patient and unfamiliar to dental environment. However when familiarization was done, the patient showed a Frankel behavior with positive rating. Intraoral examination revealed abscess 51 and 61 and carious 52, 62, 71, 72, 81, 54, and 64. There was a gross destruction of the crown of maxillary anteriors [Figure 1]. Figure 1: Preoperative photographs showing carious anteriors with abscess. Pulpectomy was planned in 51, 61 followed by composite (strip crown) restoration and restorations w.r.t. 71, 81, 54 and 64. Treatment was carried out in multiple sittings. In 51 and 61, pulpectomy was performed. Then, all four maxillary anteriors were also restored with composite restoration using strip crowns [Figure 2]. Radiographs were shown in [Figure 3]. Fluoride application was done. Oral hygiene measures and diet counselling, were given to the parents. Recall check-up was scheduled every 6 months. Figure 2: Postoperative photographs with strip crown w.r.t. 51, 61, 52, 62. Figure 3: Pre- and post-operative radiographs. Pulpectomy w.r.t. 51 and 61. The second patient was 5-year-old girl who had the chief complaint of pain in the right lower back tooth region and of multiple decayed teeth. The patient had negative Frankl rating. In the first visit, she was uncooperative so only behavior management was done. Intraoral examination revealed multiple carious teeth 51, 52, 55, 61, 63, 74, 75, pulpal involvement in 54, 62, 64, 65, 84, and root stumps of 85 [Figure 4],[Figure 5],[Figure 6]. Preoperative radiographs were taken [Figure 7]. 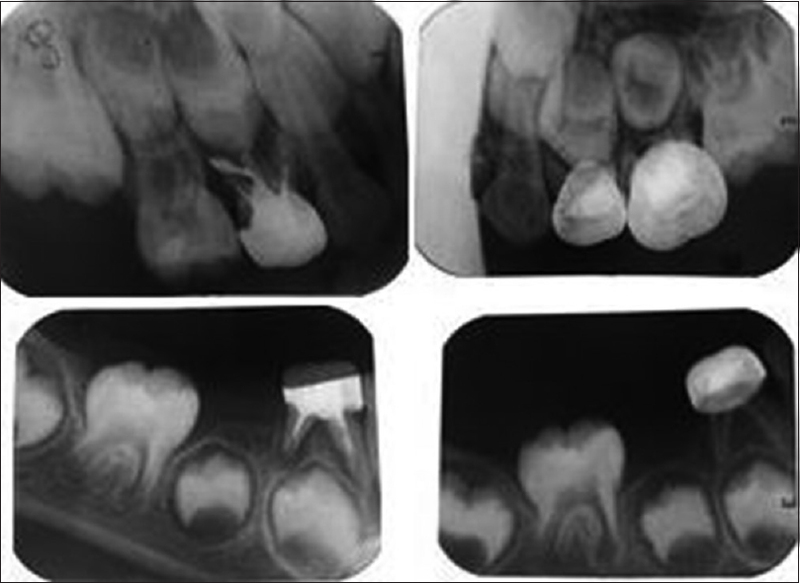 Figure 4: Preoperative photographs showing carious 51, 52, 61, 62. 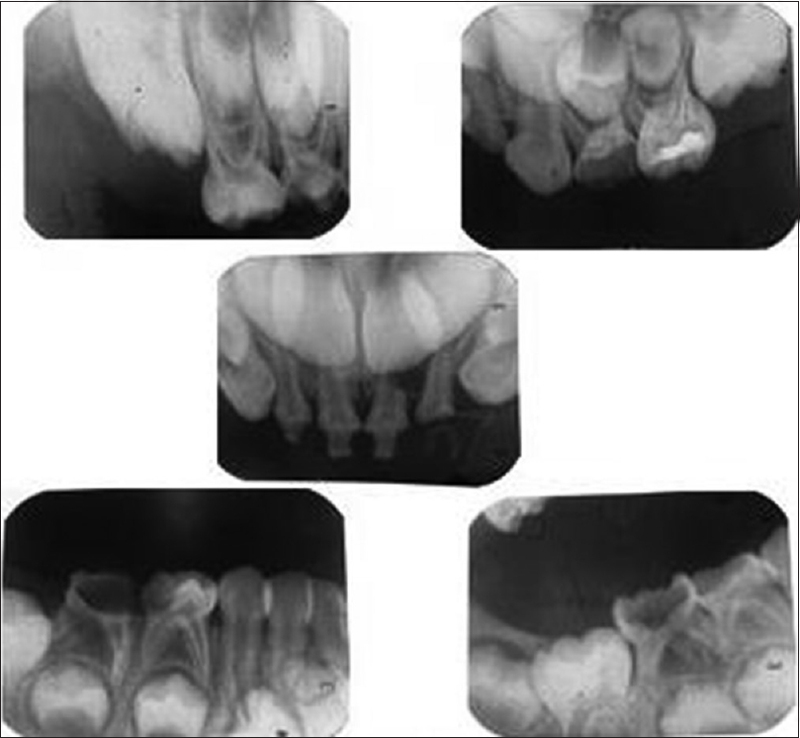 Figure 5: Preoperative photographs showing carious 51, 52, 54, 55, 61, 62, 64, 65. 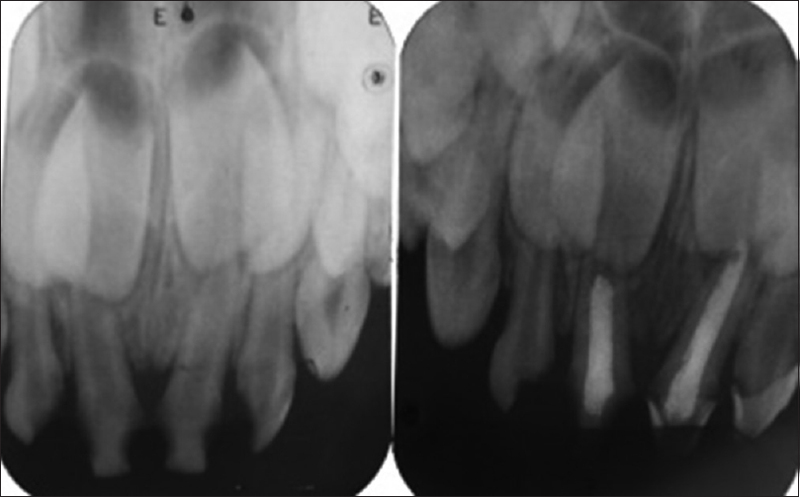 Figure 6: Preoperative photographs showing carious 74, 85, and root stumps w.r.t. 85. 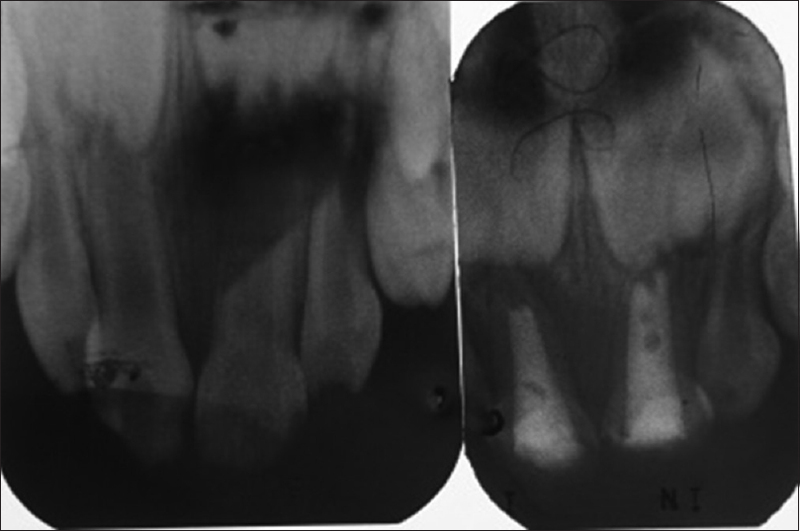 Treatment plan was endodontic treatment for 54, 84, indirect pulp capping in 74 and lesion sterilization and tissue repair for 64, 65 followed by stainless steel crowns, extraction of 75 and 85 (root stumps) followed by reverse band and loop space maintainer. Composite restorations in 51, 52, 61 and 62 were planned. Postoperative radiographs were given in [Figure 8]. Treatment was carried out in multiple sittings extending over 6 months as the patient was irregular in keeping appointments. Full mouth rehabilitation was done [Figure 9]. Oral hygiene measures and diet counseling, were given to the parents. Recall check-up was scheduled for every 3 months. Figure 9: Composite restoration w.r.t. 51, 52, 61, 62 and stainless steel crown w.r.t. 54, 64, 65, 74, 84 and bilateral reverse band and loop in lower arch. The third patient was very young as of 30 months male child with definitely negative Frankl rating. He had pain in front teeth. On intraoral examination, carious and pulpal involvement in 51 and 61 was seen [Figure 10]. Behavior management was done in the first visit. Oral hygiene measures and diet counseling, were given to the parents. While in the second visit, radiographs were taken and fluoride application was done. In subsequent visit, patient cooperation was increased so pulpectomy was done for 51 and 61 followed by glass ionomer cement restoration. After 6 months, when patient became positive then composite strip crown restoration was done for 61 and composite restoration for 51 was done [Figure 11]. Radiographs are given in [Figure 12]. Recall check-up was scheduled for every 6 months. Figure 10: Preoperative photographs showing carious 51 and 61. Figure 11: Postoperative photographs showing restored 51 and 61. Figure 12: Preoperative and postoperative radiographs showing pulpectomy w.r.t. 51 and 61. The management of immature uncooperative children is always a challenge for pediatric dentists. General anesthesia is used for such children, but is an expensive alternative. It is also associated with adverse events and unpleasant side effects. An important consideration for children who are unable to cooperate due to fear, anxiety, or young age is their subsequent acceptance of care using other methods with low risk and low impact as general anesthesia does not shape the behavior of a child. Third patient among the three presented cases was too young for sedation procedures and parents willingness was also necessary for the same. In addition to functional rehabilitation, esthetic rehabilitation of young children is also important for their personality and confidence development. Therefore, it was decided to treat these patients in the outpatient department setup itself. The management part included behavior modification, restorative work, endodontics, space management, prosthetic, and esthetic rehabilitation and the control of further progression of caries. The patients were very happy and satisfied with the functional and esthetic restorations. Restorations were found to be serving well when checked in recall appointments. All three patients had improved oral hygiene and behavior in follow up visits. Stainless steel (preformed) crowns were delivered in endodontically treated teeth, in addition was also used as an abutment for space maintainer as advocated by some authors. Full mouth rehabilitation without general anesthesia can enable children to cope with future dental care and leave them in a position where they may be more amenable to dental care. A child benefits from oral rehabilitation in more than one-way. Apart from the dental benefits, oral rehabilitation also contributes towards the improvement of general and psychological wellbeing of patients. American Academy of Pediatric Dentistry. Definition of Early Childhood Caries (ECC). American Academy of Pediatric Dentistry 2009-10 Definitions, Oral Health Policies, and Clinical Guidelines. 2008. p. 13. Drury TF, Horowitz AM, Ismail AI, Maertens MP, Rozier RG, Selwitz RH. Diagnosing and reporting early childhood caries for research purposes. A report of a workshop sponsored by the National Institute of Dental and Craniofacial Research, the Health Resources and Services Administration, and the Health Care Financing Administration. J Public Health Dent 1999;59:192-7. Milnes AR. Description and epidemiology of nursing caries. J Public Health Dent 1996;56:38-50. Rocha Rde O, das Neves LT, Marotti NR, Wanderley MT, Corrêa MS. Intracanal reinforcement fiber in pediatric dentistry: A case report. Quintessence Int 2004;35:263-8. Kindelan SA, Day P, Nichol R, Willmott N, Fayle SA; British Society of Paediatric Dentistry. UK National Clinical Guidelines in Paediatric Dentistry: Stainless steel preformed crowns for primary molars. Int J Paediatr Dent 2008;18 Suppl 1:20-8.